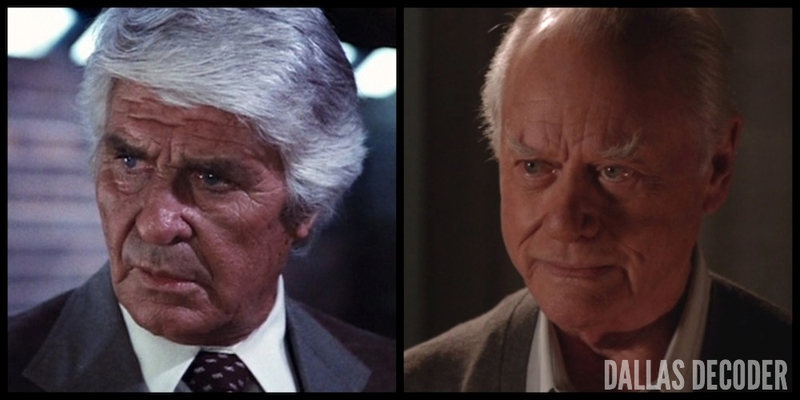 Few moments during TNT’s first “Dallas” season made me smile as much as the scene where J.R. tells John Ross, “Real power is something you take.” This was more than a great line – it was also a tribute to one of the old show’s classic sequences. In the fourth-season episode “Executive Wife,” Bobby storms into the Cattleman’s Club and interrupts Jock’s lunch with J.R. and a couple of their buddies. 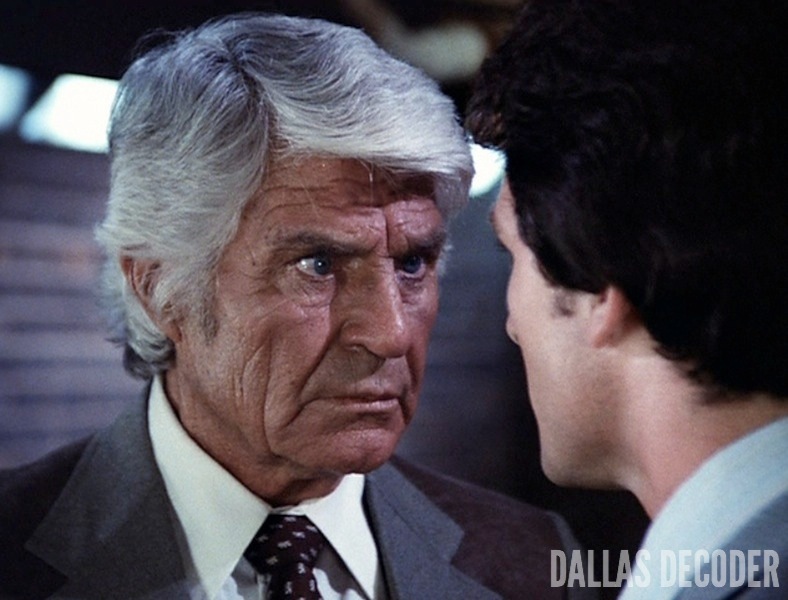 The youngest Ewing son is furious because he just discovered Jock yanked millions of dollars out of the Ewing Oil coffers without telling him, even though Bobby is supposed to be running the business while J.R. recuperates from his shooting. “You gave me the power to run that company, and damn it, I intend to run it,” Bobby fumes. In addition to evoking Jock’s philosophy, the new scene is staged a lot like the old one. Director Michael M. Robin looks over Josh Henderson’s shoulder when he films Larry Hagman, just as Leonard Katzman shot Jim Davis while looking over Patrick Duffy’s shoulder. But ultimately, the differences between the scenes are more revealing than the similarities. Jock delivers his “real power” line with characteristic bluntness while standing in a public space, reflecting his unapologetic, tell-it-like-it-is style. Jock was barracuda in business – and he didn’t care who knew it. Of course, regardless of whether the words are yelled or whispered, they still mean the same thing. Jock and J.R. are both demanding fathers who only want the best for their sons. By telling them to go out into the world and seize power for themselves, the fathers are letting the sons know they care. It’s a tough message and it’s tough love, but it’s love nonetheless. Would the Ewings have it any other way? In “Executive Wife,” a fourth-season “Dallas” episode, Bobby (Patrick Duffy) enters the Cattlemen’s Club and begins questioning J.R. (Larry Hagman) about Jock’s business deal, while Jock (Jim Davis) looks on. JOCK: Now, you just hold on Bobby. J.R. don’t discuss my business with you or anybody else unless I tell him. You understand? BOBBY: OK Daddy, then why didn’t you tell me? Didn’t you think I should know? JOCK: I was gonna tell you tonight. BOBBY: Tonight? I want those kind of things discussed with me before you act, not after. Your dealing behind my back is making me look like a fool. JOCK: Now just what the hell are you talking about? BOBBY: I called Les at the bank and asked him to transfer $12 million from the account. JOCK: So what? We’ve got 100 times that much. BOBBY: I’m talking liquid assets. Cash, Daddy, cash – and we don’t have that amount. And you know why? Because you took $10 million. JOCK: [Rises from his seat, faces Bobby] You damn right I took it. It’s mine. BOBBY: That money belongs to Ewing Oil. JOCK: And who in the hell do you think Ewing Oil is? It’s me! Ewing Oil belongs to me and don’t you forget it, boy. BOBBY: And you gave me Ewing Oil to run, in writing. And that makes you obliged to consult me before you do anything that concerns that company. JOCK: Obliged? You’re telling me that I’m obliged to ask you how to spend my own money any damn way I see fit? BOBBY: That’s right. You gave me the power to run that company, and damn it, I intend to run it. JOCK: So I gave you power, huh? Well, let me tell you something, boy. If I did give you power, you got nothing. Nobody gives you power. Real power is something you take. BOBBY: Well, I’m gonna remember that. 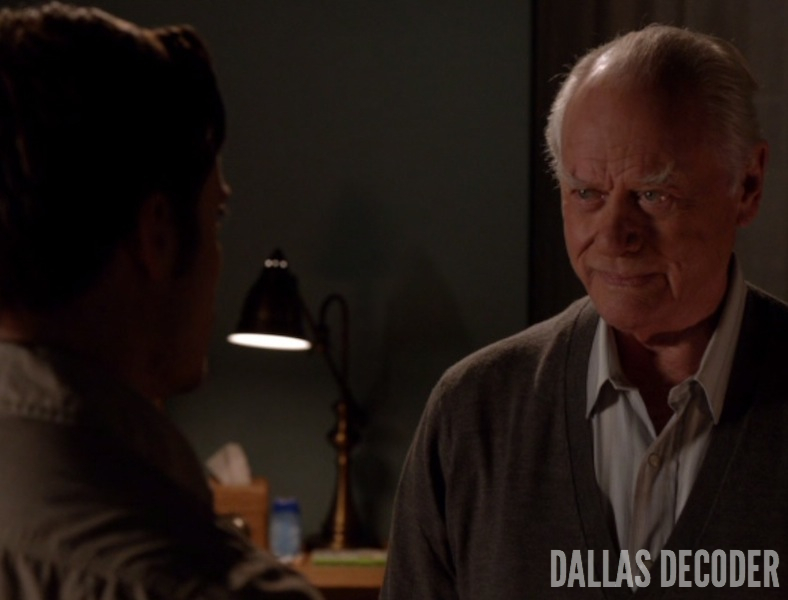 In “The Price You Pay,” TNT’s third “Dallas” episode, J.R. (Larry Hagman) shows John Ross (Josh Henderson) the leather-bound diary he uncovered in the Southfork storage barn. J.R.: All my mama’s secrets. And you’re about to use them to get the Southfork deal moving. Your Uncle Bobby’s going to find out that you are my son, tip to tail. JOHN ROSS: What do I have to do? J.R.: You up for it? JOHN ROSS: Yeah, yeah. I’m fine. J.R.: Well, I’m going to tell you the truest thing my daddy ever told me: Nobody gives you power. Real power is something you take. LOL @ Quibbling and the Cardigan! Maybe J.R did think that was the best advice he ever heard from Jock, and was jealous it was told to Bobby and not him. Or perhaps in J.R’s younger years he was told the same thing when he got too big for his cowboy hat. Yeah, as far as J.R. claiming this is the “truest thing” his daddy ever told him — I don’t think that’s an oversight on behalf of the writers. I think J.R. is choosing to remember things the way he wishes they could have happened. Or as you suggest, maybe this is something Jock told J.R. when he was younger. Yes, the greatest intensity of the old show was the passing on of the family oil company from Jock to JR and Bobby, and the way Jock was preparing and inspiring them to take it over. Now JR’s and Bobby’s passing the torches to John Ross III and Christopher is an amazing thing to watch. Those scenes about “real power” connect the three generations of these men for whom courage and agression and honor and family are everything. Wonderful and insightful comment. Thanks for sharing it! Great read. The amount of time looking into the details of these two scenes really provides an excellent read and great insight. Ooh, that’s a great point, R.J. Thank you!